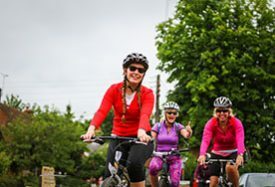 The London to Paris Bike Ride in aid of Pilgrims returns 24-28 July 2019. Are you ready for the ride of your life? Take on this iconic journey and ride all the way from London to the home of the Tour de France. Places are available for 2019. Saddle up for Pilgrims in the pinnacle of pedalling prestige. 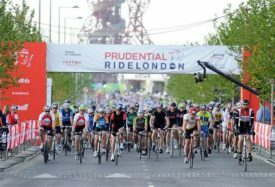 The London to Paris Bike Ride is arguably the most iconic challenge available for any keen cyclist. From your London start line, this four day challenge takes you through 295 miles of beautiful English and French countryside, passing the war memorials and cemeteries of the Somme before finishing in the heart of Paris in good time to enjoy the final day of the Tour de France. 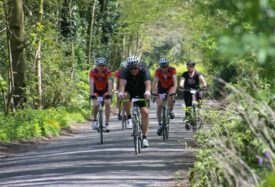 You’ll join a 200-strong group of riders of all abilities, each taking on this classic route with the same thing in common: a great sense of adventure and the desire to help their favourite charity. This very unique edition has been specially designed to allow riders to revel in the triumph of making it to Paris themselves whilst watching the professionals battle it out in the finale of the greatest race in the world – le Tour de France! Download the full challenge brochure including itinerary and FAQs. Transfer back to the start venue from St Pancras. You’ll need a deposit of just £125 to secure your place on this once-in-a-lifetime adventure. How you fund the rest is up to you! Option B Deposit £125 + self-funding £800 (no minimum sponsorship). Challenge yourself and experience the amazing atmosphere of one of the most iconic cycling events in the world.